The Holidays and winter months can be very stressful and hard on the mind, body & soul. So why not relax and enjoy life by soaking in a warm bath with the aroma of Roses in the air. Things like nice bath bombs and salts are always a great way to pamper oneself when tired and stressed. So why not give the gift of relaxation this Christmas?!? 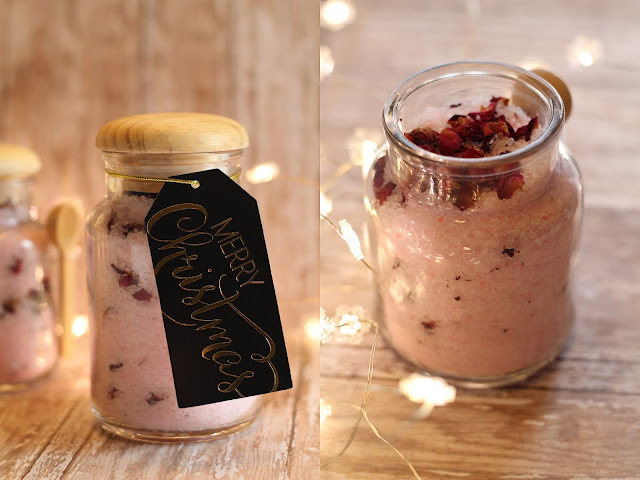 Below is a very easy DIY to make your very own bath salts, and the great part about making them yourself is that they are totally customizable. 1.In a large bowl combine 2 cups Epsom salt and 1/3 cup baking soda. And mix together. 2.Once mixed and 1.0ml fragrance or essential oils and 1 drop of food coloring. Stir until all the food coloring is incorporated into the salt and baking soda mixture. Maybe add a cute ribbon or gift tag and give out to loved ones to enjoy on a cold winters night. Remember these can be customized. If you are not a fan of rose then change the sent, maybe go for lavender or since its Christmas time peppermint. Whatever floats your boat! I hope you are all having a lovely Monday. Love this idea! I can probably get almost all the items from Micheals!